Across the road from a park and an easy walk to the beach, this 4 bed, 2 bath double garage home on an easily managed 300m2 block offers a rental yield of 4.4-4.7% on an initial turnkey price of $389,677. In the master-planned community of Golden Bay Estate, between Secret Harbour and Mandurah in the south of Perth, this is a coastal investment opportunity designed to help you to the kind of financial future that will allow you to holiday where you choose. With its potential yield, it is an investment that you can also afford without too much detriment to your current lifestyle. 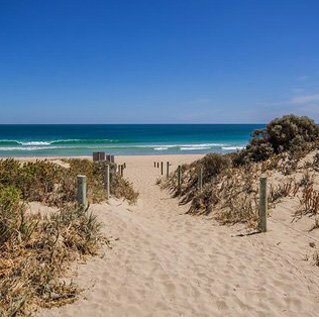 Golden Bay, with its beautiful long strip of golden sand and eight parks that feature walking trails, playgrounds and skateboard ramps, is roughly 45 minutes from both Perth’s CBD and airport. There are plans to build a primary school and shopping centre in the estate. This will aid the capital appreciation of the property while attracting quality tenants. Secret Harbour’s shopping centre, which has just had over $50 million invested in it, is a short drive away, as are Mandurah and Warnbro where buses also connect to the train line into Perth. This is a beachside investment that will encourage long-term rather than holiday tenants. With many of the houses in Golden Bay being old and formerly used as holiday houses, these new houses with all the mod cons have a distinct advantage in the rental market and superior depreciation benefits. This month’s featured property combines the potential of the beach in terms of tenanting and capital gain, but without the same risk of investments in coastal hamlets where employment is fickle and the property market unreliable. We want all our clients to enjoy a happy and prosperous future, so why not talk to us about taking advantage of this excellent opportunity today.